The Motic Panthera L Biological Digital Microscope is the latest Microscope series which has been carefully designed with an attention to practicality, functionality, and aesthetics aspects. The RedDot award winner Panthera L is a smart microscope with user-friendly digital capabilities designed for life sciences applications. The smart CAM digital head with the Imaging-on-device system allows you to control and view images in your fingertips through WiFi and the Panthera App. 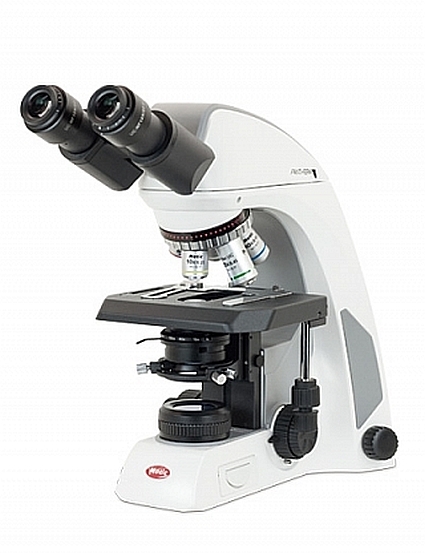 Images can be viewed and captured instantly by simply scanning the unique QR code on the top of the microscope. Images can also be captured instantly by pressing the light intensity control knob. The HDMI port allows direct connection to HDMI display in full HD resolution. The LAN port offers the options of remote image sharing or connection to other Panthera L via DigiLab software. The LED indicator on the nosepiece displays the light intensity of the microscope controlled by the digital light intensity control knob. The Motic Light Tracer with the encoded nosepiece memorizes the light intensity of each nosepiece position and returns to the last illumination setup when this position is recalled. The microscope is also equipped with the Auto on/off function to save energy and extend the life of the bulb. Panthera L comes with a 25º inclined, 360º rotatable Siedentopf observation head with the premium CCIS Plan UC optics offer unprecedented brightness, contrast, sharpness and flatness over the entire field of view. It also supports other contrast techniques such as Phase Contrast, Darkfield, Polarizing and LED Epi-Fluorescence. Panthera L is packed with more other user-friendly features including the new patented rackless coaxial mechanical stage, the most compact size in its class with durability and reliability. The microscope illumination is interchangeable between 30W Halogen/ 3W LED or LED at different colour temperature with the new light module drawer located at the base. A safety design is incorporated into the microscope arm to prevent the observation head from falling when the head locking screw is loosened.